As an instructor the first thing you should address is the physical postural challenges of a rider, because only when they are in good posture can they correctly apply the aids. However, posture is impacted by both the rider’s physical condition as well as their mental condition. We see this in how a nervous rider gets stiff and loses their soft relaxed posture, or in how when a rider doesn’t understand what you are asking them to do they cannot perform it. In the last part we talked about physical challenges, in this part I will share notes on cognitive challenges and suggestions for support. Have perspective that there is always potential for learning and growth with the right communication and strategies and support. Such as the support given to rider three in the above example. Focus on their abilities, not their disabilities. Maintain their dignity – don’t talk down. Give opportunities for decision making. Provide appropriate feedback that they can understand and respond to – if they’re not responding, adjust. Use simple 1-2 step directions, then proceed to more as they are ready. Give time to process. (Count to 5 or 10 in your head). Use pictorial cues or systems. Encourage exploration. The horse is a large, gentle, rhythmic, predictable being – invite the rider to explore, and assist them. Look at them when you speak (so they know you are talking to them). Figure out their motivation. Do they like their horse walking but don’t like exercises? Then do exercises at the halt and walk on for reward. Use a consistent hierarchy of prompts. Get the whole team on board so they can facilitate instead of depending on you. Forward Chaining = Begins with first, progresses to last. Once he can perform the first well, do the first and second and reinforce, taught together (A and B) not separately (A then B). When these are mastered add C.
Backward Chaining = Teach backwards, effective for complex sequences. Example: You put the puzzle together and let him do the last piece. Then you put it together and let him do the last 2 pieces. And so on. Once they learn the last step, reinforce it. Once they learn the last 2 steps, only reinforce them when done together. To use chaining, 1) Define the target behaviors, 2) Identify the steps – small and manageable, 3) Reinforce successive elements of the chain, 4) Monitor results – determine when to move on or practice more. Use your task analysis! = reinforce successive approximations toward a target behavior to slowly shape it. Reinforce behavior that is closer to the target than the last one. If the same behavior is repeated several times, withhold reinforcement to encourage a new closer approximation. If a new approximation does not occur, or a child regresses, you may need to reinforce the old behavior and start again. If they’re stuck, withholding reinforcement often induces different behaviors, one of which will be an approximation for you to reinforce. Ex) One rider touches the horse’s neck for walk on. At first we reinforce by having the horse walking on if she reaches forward a little. 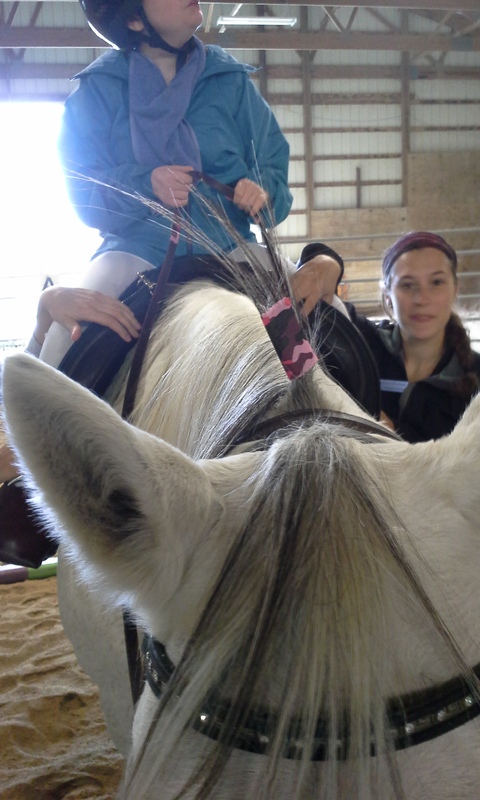 I start asking her to stretch farther forward to actually touch the horse’s neck. Once she does this, the horse will only walk on if she reaches forward all the way. If she gets confused, we go back to just reaching forward a little. Directions should be brief & clear. Make statements or short commands. Questions can be harder to understand. Give explicit and systematic instruction, step by step, with ongoing prompting, feedback and support. Use the same wording every time. Plan out the method with your sidewalkers before the lesson so everyone can work together. Give them time to process by waiting for a response. Wait! Wait till the count of 5 in your head. Give them time to understand, formulate a response, and motor plan. Wait quietly. Speaking to them can compete with their thought and motor planning process. Make sure the whole team knows to wait so volunteers don’t jump in to help too soon. Ask the sidewalkers to wait 5-10 seconds before prompting. Then give another verbal prompt, count to 5 or 10. Then a visual or physical prompt, etc. If they look away they may be thinking about it, not just ignoring you. How often do you look off into the distance when you’re thinking about something? Give them choices. Ex) Instead of asking “What do you want to do?” give them 2 choices. 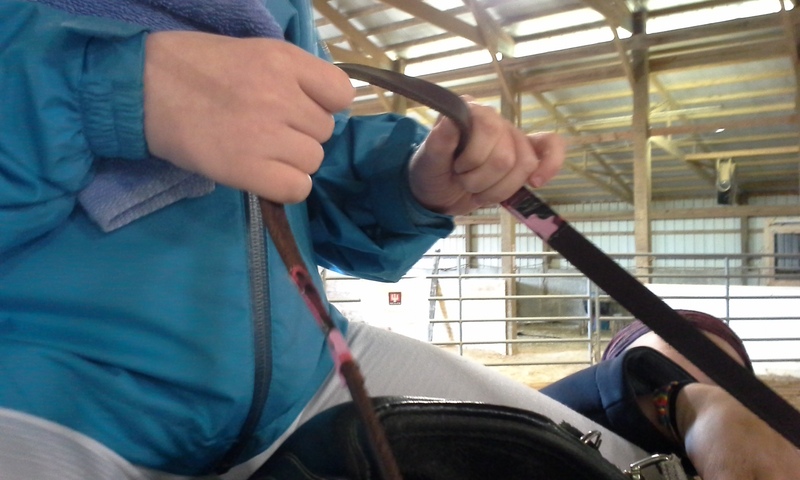 Ex) One young rider had trouble maintaining midline and understanding what “don’t lean, stay in the middle” meant, so every warm up I began having him pass rings back and forth having to stretch really far, while saying “leeeeean for the ring! And back to the middle!” making sure he had to pause in each position. Within a few weeks he understood what “stay in the middle” meant and had improved core strength enough to respond to such prompts when he started to lean. Ex) to walk on, first hold reins. Later add sit tall. Ex) for exercises, halt, do one exercise, then walk on; later add two exercises, then three, etc. Remember: as a TR Instructor your goal is communication so they can learn riding skills, not speech therapy. Be aware of subtle communication, body language, etc. Use iPads – communication apps such as touch chat, proloquogo – Add a horse page for things they learn at the barn. Use these pages during lessons, and encourage family/teachers/therapists to utilize them at home and school. Encourage communication in the environment. Create communicative temptations, such as setting up the ring with something they want (a ball) then encourage their communication to ask to play with it. Thanks, for the concise info on teaching special needs-cognitive challenged riders. Going into my notebook for teaching riding.